Received: December 27, 2017; Revised: March 27, 2018; Accepted: April 16, 2018; Published online: June 14, 2018. Mesenchymal stem cells are classified as multipotent stem cells, due to their capability to transdifferentiate into various lineages that develop from mesoderm. Their popular appeal as cell-based therapy was initially based on the idea of their ability to restore tissue because of their differentiation potential in vitro; however, the lack of evidence of their differentiation to target cells in vivo led researchers to focus on their secreted trophic factors and their role as potential powerhouses on regulation of factors under different immunological environments and recover homeostasis. To date there are more than 800 clinical trials on humans related to MSCs as therapy, not to mention that in animals is actively being applied as therapeutic resource, though it has not been officially approved as one. But just as how results from clinical trials are important, so is to reveal the biological mechanisms involved on how these cells exert their healing properties to further enhance the application of MSCs on potential patients. In this review, we describe characteristics of MSCs, evaluate their benefits as tissue regenerative therapy and combination therapy, as well as their immunological properties, activation of MSCs that dictate their secreted factors, interactions with other immune cells, such as T cells and possible mechanisms and pathways involved in these interactions. Mesenchymal stem cells (MSCs) were first discovered by Friedenstein in the 1970s as fibroblast-colony forming cells (Friedenstein et al., 1970) and since then have been subject of study, although they were not named as such until Caplan proposed it due their demonstrated capability to differentiate into other tissues such as cartilage and bone in vitro. The International Society for Cellular Therapy (ISCT) proposed three minimal criteria that cells must fulfill to be classified as MSCs: (1) characterized by plastic adherence; (2) >95% of the cells must express surface molecules such as cluster of differentiation (CD)105, CD73 or CD90, as well as <2% of expression of CD45, CD34, CD14, CD19, major histocompatibility complex (MHC) II; (3) show multipotent differentiation potential (Dominici et al., 2006). Mesenchymal stem cells are capable to self-renew, but only for a limited time in vitro, and their lifespan can also vary from species to species. By the fact MSCs can be expanded in vitro, it makes them a good resource to apply them as therapy for different ailments. There are some companies, such as Osiris that invest all their research resources unto regenerative medicine using MSCs and by 2012 they received clearance from Health Canada to put on the market the world’s first approved stem cell drug. In the case of veterinary hospitals, in the United States they have been offering stem cell therapy since 2003, using mostly bone marrow (BM) and adipose tissue (AT) MSCs; however, there is currently no approval of their use from the Food and Drug Administration (FDA) nor a full understanding of these cells (Cyranoski, 2013). Along with the use of BM and AT MSCs as stem cell therapies, the non-expanded stromal vascular fraction (SVF) is also vastly used under same name as “stem cell therapy”. In this review, we describe MSCs characteristics, their role on tissue regeneration, their interaction with the immune system by discussing some effects of their stimuli-activation, interactions with immune cells, specially T lymphocytes and mechanisms involved in these interactions, which are starting to be elucidated by research conducted to date on MSCs. Mesenchymal stem cells, nowadays also known as mesenchymal stromal cells, are classified as multipotent stem cells, due their capability to transdifferentiate into various lineages that develop from mesoderm (Caplan, 1991). The multipotent stem cells, unlike their cousins the pluripotent stem cells, are theoretically able to differentiate to only one germ layer (Mahla, 2016). Despite their classification, it has been documented that MSCs can differentiate in vitro into non-mesodermal cells, including neuron like cells (Kopen et al., 1999), hepatocytes, and pancreatic islet like cells (Xiong et al., 2014). Pancreatic islet cells transdifferentiation ability of MSCs was first reported by Chen et al. (2004) and it was also corroborated by other studies (Bai et al., 2015). Though the actual nature or functions from MSC is still unclear, there is a new theory that claims MSCs are actually perivascular cells or pericytes, given that they can be isolated from all vascularized tissue, including menstrual blood (Alcayaga-Miranda et al., 2015) and they also express pericytes markers CD140a, CD140b and a-SMA (Kaewsuwan et al., 2012; Squillaro et al., 2016). Being firstly discovered on BM, this has been the most representative source of MSCs and the most studied until now. Later on, it was made known that MSCs can be extracted from a great variety of tissues, including adipose tissue, umbilical cord (Arutyunyan et al., 2016), umbilical cord blood (Koch et al., 2007; Schuh et al., 2009), Wharton’s jelly (Teixeira et al., 2015; Gaafar et al., 2017), amniotic fluid (Fei et al., 2013), skeletal muscle tissue (Kisiel et al., 2012), periosteum (Kisiel et al., 2012), gingiva, periodontal tissue (Mrozik et al., 2010; Otabe et al., 2012), liver tissue (Najimi et al., 2017), lung tissue (Nordgren et al., 2018), menstrual blood (Ulrich et al., 2013; Ren et al., 2016) and more. After BM, one of the most usual source for MSCs is adipose tissue and it has become one of the most preferred choice of adult stem cells for clinical applications due their abundance per gram of tissue and their easy accessibility compared to BM-MSC (Strioga et al., 2012). It has been reported a slight difference on cell yield of MSCs depending on anatomical region where adipose tissue is extracted (Bahamondes et al., 2017; Hakki et al., 2017). According to the U.S. National Institute of Health, MSCs are being used in more than 800 clinical trials for various diseases, in which ailments of skeletal muscle are the most targeted, while being followed by conditions that compromise the immune system (Clinical Trials.gov) like graft-versus-host-disease (GVHD), autoimmune diseases, hematological malignancies, cardiovascular conditions, neurological diseases, bones and cartilage defects, and refractory wounds in organ transplantation (Squillaro et al., 2016). The most recently focused ailments treated with MSCs are for acute liver failure cirrhosis and regeneration of bladder tissue, heart scar repair after attack, dental problems, bone degeneration, muscle degeneration and alopecia (Mahla, 2016). In terms of pluripotency and self-renewal capacities, MSCs are not as powerful as ESCs. Though ESCs might seem the ideal choice for cellular therapies, the ethical issues involved in their isolation procedures, makes them a difficult alternative for their actual therapeutic use (Lo and Parham, 2009). Induced pluripotent stem cells (iPSCs), as adult cells with over-expression of pluripotency factors such as OCT4, NANOG, SOX2, c-Myc, KLF44, and more, can be highly similar to ESCs, with self-renewal properties, great differentiation potential, but might show genomic unstability (Mahla, 2016). MSCs are multipotent, self-renewal, with easy accessibility and culturally expandable in vitro with exceptional genomic stability and few ethical issues, marking its importance in cell therapy, regenerative medicine and tissue repairment (Ullah et al., 2015). Another thing to notice about MSCs is their immuno-privileged status, by the lack of MHC II expression which is particularly important, as these molecules are usually detected by T-cells concurrent with an antigen on the surface of antigen-presenting cells (APC) and it leads to inflammatory reaction. In order for the usual recognition of antigens from any cell not recognized as “self” from the body to take place, there must be a signal interaction between CD28 expressed on the T-cell and CD80 or CD86 expressed on the APC to fully activate T cells. As MSCs lack CD80, CD86, and MHC II or have extremely low expression of the last molecule (Jacobs et al., 2013), they do not provoke allogeneic reactions mediated by T effector cell and therefore have great potential for use as “off the shelf” products in allogeneic therapies (Le Blanc et al., 2003). Mesenchymal stem cells secrete trophic factors that reportedly promote cell survival, such as stromal derived factor-1 (SDF-1), hepatocyte growth factor (HGF), insulin-like growth factor (IGF-1), epithelial growth factor (EGF), nerve growth factor (NGF), transforming growth factor-alpha (TGF-a), and tissue angiogenesis vascular endothelial growth factor (VEGF) (Rhee et al., 2015) (Fig. 1). The importance of SDF-1 has been investigated in a rodent model of bronchopulmonary dysplasia in which SDF-1 knocked down MSCs showed significantly reduced beneficial effectors in alveolarization, angiogenesis and inflammation characterized by macrophage infiltration in alveolar spaces relative to non-silenced control MSCs (Reiter et al., 2017). In an ischemic murine skin flap model, VEGF paracrine expression was increased in 4 days after murine MSCs (mMSCs) treatment, where VEGF was highly immunodetected in MSCs and in a small cluster of cells around capillaries compared to the control group (Schlosser et al., 2012). Another feature of MSCs is their ability to migrate toward injury sites through chemoattractant gradients in the stromal extracellular matrix and peripheral blood. In these injury sites, local factors such as hypoxia, cytokine milieu, and toll like receptor ligands can stimulate MSCs functions. Therefore, these stimuli all promote the formation of abundant growth factors by MSCs that converge together to augment tissue regeneration (Rhee et al., 2015). For example, in experimental autoimmune thyroiditis, there was migration and nesting of intercellular adhesion molecule (ICAM)-overexpressing mMSCs towards the inflamed thyroid (Ma et al., 2017). Since MSCs are primarily used as cell therapy for joint or limb injury in canine or equine animals (Volk and Theoret, 2013), information regarding the chondrogenic and osteogenic potential is of particular importance. In the case of chondrogenesis of hMSCs, an in vitro study showed that large quantities of IL-6 might also enhance transdifferentiation to chondrogenic tissue through activation of STAT3, which is part of the JAK/STAT pathway (the primary regulatory pathway for cytokine expression) (Rawlings et al., 2004). Unstimulated MSCs are capable to secret IL-6 and this can be beneficial or harmful depending on the target cells, organs and/or in vivo environment. Still, it is needed to take in account that IL-6 is commonly detected in the synovial fluid of osteoarthritic (OA) patients, and the actual quantities of IL-6 that were capable to enhance chondrogenesis, were much higher than those in OA patients; therefore, it is difficult to say that a higher IL-6 is associated with greater chondrogenic differentiation. Rather, this differentiation might rely much more on its local effects in the proximity of producing cells (Kondo et al., 2015). Now, STAT3 plays a role in tissue regeneration by MSCs and it has been documented that its activation or inactivation can modulate their trophic effects. If activated, STAT3 has been shown to be involved with cardiac repair and left ventricular function improvement by porcine MSCs (pMSCs). pMSCs increased expression of HGF and VEGF in the skeletal myocyte cell line C2C12. In the TO2 cardiomyopathic hamster model, intramuscular injection of pMSCs into the hamstring appeared to have a global trophic effect, since these factors were increased in the circulatory system, as well as in quadriceps, the liver, and the brain and attenuated myocardial apoptosis (Shabbir et al., 2010). Conversely, in the case of fibrotic injury, it is through STAT3 inactivation that MSCs beneficial effects can be seen (Matsui et al., 2017), like in the case of renal fibrosis (Matsui et al., 2017). Renal fibrosis is considered a common result of kidney diseases, and is frequently reported as a pathological diagnosis in chronic kidney disease (Lawson et al., 2015). When injured, an interstitial inflammatory infiltration results in production of various cytokines and growth factors, including transforming growth factor-beta (TGF-β), tumor necrosis factor-alfa (TNF-α), angiotensin-II (ANG II), and IL-18. ANG II stimulates STAT3 in tubular epithelial cells and mesangial cells (Matsui and Meldrum, 2012), which also leads to deposition of collagen, fibronectin, matrix metalloproteinase-9 (MMP-9) and tissue inhibitor of metalloproteinase-1 (TIMP-1), thus increasing fibrosis. Treatment with hMSCs induced a decrease in STAT3 activation, STAT3-dependent MMP-9 production and tubulointerstitial fibrosis (Matsui et al., 2017). Reduction of fibrosis by mMSCs was also reported in the cisplatin-induced acute kidney injury model, and their conditioned media reduced interstitial fibrosis, tubular cell apoptosis, and urinary kidney injury molecule-1 (Kim-1), though involved mechanisms were not reported (Abouelkheir et al., 2016). Another example of tissue healing through MSCs is in the hypertrophic scar (HTS) model. In the process of hypertrophic scarring, there is an abundant deposition of extracellular matrix (ECM) which is produced by fibroblasts and myofibroblasts, being these last ones differentiated from fibroblasts and also an important step to HTS development. This is accompanied by an increase of inflammatory mediators through infiltration of immune cells (Liu et al., 2014; Domergue et al., 2016). In the HTS model, rabbit BM-MSCs (rMSCs) were injected through the ear artery, after which they migrated toward scar tissue and led to reduction of scar elevation index (SEI) at 3, 4 and 5 weeks after injection, and also to less collagen deposition compared to control group with no rMSCs injection. rMSCs also downregulated transforming growth factor-beta receptor I (TGF-βRI) and alpha-smooth muscle actin (α-SMA) at the mRNA and protein level of fibroblasts (Liu et al., 2014), both of which are needed for myofibroblast differentiation (Wipff and Hinz, 2008). Moreover, p53 also seems to be one of the pathways involved in HTS, as p53-knockdown of rMSCs augmented fibroblasts and nitric oxide, which increased fibrosis (Liu et al., 2014). Due to the rising popularity of MSCs as potential treatments, their application along with different methods or strategies is being studied to enhance the quality of administered MSCs and achieve regenerative responses. Among the investigated methods, extracorporeal shock wave (ESWT) in eMSCs is of note. If a horse damages its limbs with no way of recuperation, it becomes economically unfavorable and difficult to care for. Therefore, it is of utmost importance to focus on treatments aimed at limb healing (Vidal et al., 2008; Carrade Holt et al., 2014). Extracorporeal shock wave treatment, which in veterinary medicine is usually applied to equines for optimization of bone, tendon and cartilage restoration, may induce a 2-fold upregulation of Erk1/2 in eMSCs, a proliferation marker, as well as enhanced adipogenic and chondrogenic differentiation potential (Raabe et al., 2013). Another method of using MSCs as a conjunctive therapy is utilizing a custom, progressive, dynamic orthosis (CPDO), which has been reported in a case of gastrocnemius tendon injury in a dog. Following autologous cMSCs injection into the core lesion, its thickness was reduced along the dorsoplantar plane, and a mild return of a linear fiber pattern in small sections of the gastrocnemius tendon was observed at day 98. Although there was incomplete recuperation of the tendon fiber pattern, the functional result was considered equal to successful surgical approach outcomes (Case et al., 2013). Improved animal MSCs regenerative therapeutic effect, especially for chondrogenic differentiation, has also recently been achieved through their transfection with a minicircle vector containing the high-mobility-group (HMG) transcription factor, SOX9, which upregulates type 2-collagen (COL2A1) (Tidd et al., 2017). Although the exact mechanisms underlying MSCs immunomodulation are not entirely understood, it is assumed that the main factors are cell-to-cell contact and/or release of soluble factors (Sharma et al., 2014). Mesenchymal stem cells can be found in their default niche in a resting state, where they present bystander anti-apoptotic and immune homeostatic features mostly inclined towards suppression. These features can be enhanced via MSCs activation by certain environmental stimuli (Krampera et al., 2013). The activation of MSCs is accomplished through individual or combined cytokines such as IL-1β, TNF-α, and IFN-γ (Singer and Caplan, 2011). For example, IFN-γ can be found in supernatants of cMSCs with stimulated leukocytes from mixed lymphocyte reaction (MLR), and subsequently, cMSCs become able to inhibit lymphocyte proliferation (Kang et al., 2008). However, MSCs have little or no effect on unstimulated peripheral blood mononuclear cells (PBMC) (Le Blanc et al., 2003). Once activated, MSCs secrete various immunomodulators including nitric oxide (NO) (Sato et al., 2007), IDO, PGE2, IL-6, and IL-10. All of these influence immune cells, including dendritic cells (DC), natural killer (NK) cells, macrophages, B cells and both CD4+ and CD8+ T cells (Rhee et al., 2015). After MSCs activation with MLR, in presence of serum, Clark reported inhibition of lymphocyte proliferation by eMSCs through PGE2 secretion in co-culture supernatant, but in the absence of serum, this secretion was shown to be markedly decreased, though anti-inflammatory IL-10 production was increased. Nevertheless, in both serum and serum free media (SFM), PGE2 seemed to be one of the main inhibitors of T-lymphocyte. MSCs activation by TLR: MSCs can produce different cytokines depending on different stimuli. Among these stimuli, is to notice the pathogen-associated molecular patterns (PAMPS) such as lipopolysaccharides (LPS) and damage-associated molecular patterns (DAMPS), which act through toll like receptors (TLRs). Although MSCs are immunosuppressive biased, it has been proposed that polarization of MSCs through activation by different kinds of TLRs can result in different MSCs phenotypes (Fig. 2). For example, hMSCs can be either proinflammatory MSC1, which might secrete increased levels of IL-6, IL-8 or TGF-β, involving TLR4, or anti-inflammatory MSC2, which secrete IL-10, indoleamine 2,3-dioxygenase (IDO), and prostaglandin (PGE2), involving TLR3 (Burr et al., 2013; Krampera et al., 2013; Lim et al., 2016). However, differences by species may exist. For example, Lei et al. (2011) reported that TLR2 ligation of mMSCs completely restored and even stimulated lymphocyte proliferation on MLR. TLR2 ligation of mMSCs also reduced expression of CXCL10, which is involved in MSCs migration, and even reduced mMSCs-mediated expansion of CD4+CD25+FoxP3+ T regs. Conversely, non-treated mMSCs and TLR4 ligated mMSCs inhibited lymphocyte proliferation, maintained ability to promote T regs generation and increased CXCL10 expression from day 1 (Lei et al., 2011). 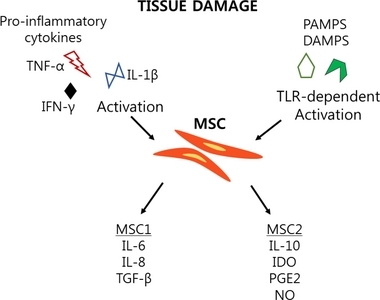 Therefore, it is possible that TLR2 is involved in proinflammatory MSC1 phenotyping on mMSCs and not TLR4. As suggested by Caplan, MSCs can similarly function as an “injury drugstore” and they present diverse interactions involving immune cells. Described first by Bartholomew, MSCs are able to suppress alloantigen induced proliferation in MLR (Bartholomew et al., 2002), and as previously mentioned, can be attributed in part to MSCs produced soluble factors, such as prostaglandins (English and Mahon, 2011), NO, IDO, as well as to the inflammatory environment with IL-1β, TNF-α, and IFN-γ. For example, the presence of IFN-γ can reduce MLR by MSCs through induction of IDO (Ryan et al., 2007). IDO acts through kynurenines, which catalyze tryptophan depletion from the environment, leading to cell cycle arrest. IDO subsequently induces apoptosis by caspase 8 activation and mitochondrial cytochrome-c release, and they might also induce FoxP3+ T regulatory cells (Fallarino et al., 2002). Cell cycle arrest on PBMC is also assumed to be induced by periodontal ligament stem cells (PDLSC). PDLSC are derived from mature periodontal ligament of canine dental tissues, which are of ectomesenchyme origin and possess both neural crest and mesenchymal markers (Zhu and Liang, 2015). Periodontal ligament stem cells have shown potential to inhibit allogeneic and even xenogeneic PBMC proliferation, which is assumed to occur because of cell cycle arrest. This was measured with trypan blue, which showed that only 20 to 30% were apoptotic cells in every group of PHA-stimulated PBMC that were co-cultured with or without cMSCs and PDLSC (Kim et al., 2010). cMSCs incubated with mitogen-stimulated leukocytes can inhibit their proliferation from a ratio of 1:1 to 1:10 (cMSCs:leukocytes). However, not only do the cells have this effect, the supernatant from cMSCs is also able to block leukocyte proliferation. This indicates that soluble immunomodulatory factors are also present in conditioned media. Indeed, PGE2 and IDO, which are well known immune tolerance key factors, are found in higher levels in conditioned media obtained from cMSCs co-culture with leukocytes than in supernatant from cMSCs alone (Kang et al., 2008; Lee et al., 2011), once again confirming that MSCs immunomodulation is enhanced after activation by certain stimuli. Interaction with T cells: One of the cell interactions of utmost importance on immunosuppression by MSCs soluble factors is with the T lymphocytes. In the case of NO secretion by MSC, is reported to cause T cell suppression through cell cycle arrest (Glennie et al., 2005), or also apoptosis (Plumas et al., 2005). In eMSCs, this mechanism can vary according to the MSCs source. Carrade reported that equine tissue derived MSCs (AT and cord tissue) inhibited T cell proliferation through apoptosis. On the other hand, in equine BM and cord blood MSCs, this occurred through induction of cell cycle arrest in G0/G1 (Carrade Holt et al., 2014). Sato et al. (2007) reported that one of the suppression mechanisms of NO secreted from mMSCs is through the decrease of STAT5 phosphorylation in T-cells. In here, after mMSCs are stimulated in the presence of activated T lymphocytes, instead of targeting T-cell receptor complex, it induces a decrease in the phosphorylation of STAT5, working in a downstream signaling activating protein kinase C and calcium (Ca2+) influx. This is similar to the mechanism macrophages perform in order to decrease T-lymphocyte in inflammatory environment (Sato et al., 2007). These inhibitory effects toward T cells might also be helpful in the treatment of canine hypothyroidism. Hypothyroidism can be caused by idiopathic atrophy or immune mediated destruction of the thyroid gland because of mononuclear cell infiltration, consisting mostly of T-lymphocytes, which first causes thyroiditis by T cells (Lee et al., 2004). In an experimental autoimmune thyroiditis mouse model, mMSCs were found to influence immunocytes by downregulating IFN-γ and IL-17, as well as upregulating the anti-inflammatory cytokines IL-10 and IL-4 on T cells. These findings suggest that a change from Th1 towards their regulatory phenotype, Th2, occurred (Ma et al., 2017). It has been suggested that the immunosuppressive function of MSCs depends mainly on their ability to induce an effect on generation or function of regulatory T lymphocytes (Engela et al., 2012). As previously mentioned, PGE2 from MSCs heavily impacts functions of cells associated with cellular-mediated immunity, such as T cells (Fig. 3). If PGE2 is found in high levels, T cell proliferation is inhibited through decreased IL-2 and downregulation of IL-2 receptor. This leads to impaired DNA-binding activity of transcription factors via Janus kinase-3 signaling suppression (Burr et al., 2013). 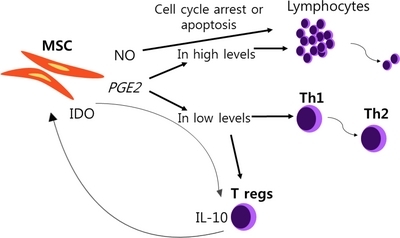 Conversely, if found in lower concentrations, PGE2 shows a more regulatory function by helping shift Th1 towards Th2/Th17 by blocking proinflammatory cytokines and promoting Th2 cytokines such as IL-4 and IL-5. More importantly, it induces Foxp3+ T regs through prostaglandin E receptor activation, this last one supposedly due to activation of nuclear factor-kB pathway (Kalinski, 2012; Burr et al., 2013). This fact is important because it indicates the opportunity to use both MSCs and T regulatory cell in a combinatorial therapy. This is because they do not interfere with each other, but instead work in a synergistic interaction as T regs support activation and efficiency of MSCs, which express IDO, resulting in TNF-α reduction and inducing IL-10 production in T regs and effector cells (Engela et al., 2013). Different subtypes of T regs generated by MSCs have been identified, including CD4+CD25+Foxp3+ regulatory T and IL-10 producing type 1 regulatory T (Tr1). The combination of mMSCs with either type of T regs results in reduced splenic T cell proliferation compared with single cell lines. Indeed, in a rheumatoid arthritis mouse model, MSCs infusion with Tr1 cells prevented swelling or redness in the front or hind paws at 5 weeks after first infusion and led to a lower degree of mononuclear cell infiltrate and pannus formation with superficial cartilage damage when compared to controls (Lim et al., 2016). As we have seen, MSCs are a promising alternative therapy that have high potential for both regenerative therapy and immune therapy; these cells secrete trophic and immunomodulatory factors (Table 1, 2) that interact according to the environment and environmental cues. As mentioned before, MSCs are multipotent, self-renewal, with easy accessibility and culturally expandable in vitro with exceptional genomic stability and few ethical issues, marking its importance in cell therapy, regenerative medicine and tissue repairment (Ullah et al., 2015). Another thing to notice about MSCs is their immuno-privileged status, by the lack of MHC II expression which means that they do not provoke allogeneic reactions mediated by T effector cell and therefore have great potential for use as “off the shelf” products in allogeneic therapies (Le Blanc et al., 2003). On the other hand, some of disadvantages are that MSCs are considered to have self-renewal properties, but as the subculture number increases, they start losing their potency, due to their decrease on telomerase activity which causes telomere shortening, resulting in cellular senescence (Bonab et al., 2006). The therapeutic value of MSC can be influenced by donor age, as MSCs from old donors show a decreased proliferation potential (Ganguly et al., 2017). In terms of pluripotency and self-renewal capacities, MSCs are not as powerful as ESCs. Although there is no in vivo evidence that these cells exert their regenerative effects through differentiation to target cells, there is an interaction between cytokines and/or growth factors secreted by them that can help recuperate homeostasis, thus contributing to tissue healing. Accompanied by their interactions on immunological signaling shown through in vitro experiments, their tendency to confer immunosuppressive cues is the reason they are being mainly appointed for treatments of hypersensitivities or autoimmune diseases. There is still a large list of unknown facts that are involved with MSCs cooperation with other cells. Accordingly, there is great demand for elucidation of their mechanisms and additional research is needed to develop accurate strategies to enable their efficient use in cellular therapy. This work was supported by the Global Research and Development Center (GRDC) Program through the National Research Foundation of Korea (NRF) funded by the Ministry of Science and ICT (2017K1A4A3014959). In addition, this work was also supported by a grant (no.317021-03-1-CG000) from Korea Institute of Planning and Evaluation for technology in Food, Agriculture and Forestry, Republic of Korea. cMSCs in combination therapy with custom, progressive dynamic orthosis. AT: adipose tissue; BM: bone marrow; NR: not reported; VEGF: vascular endothelial growth factor; MCP-1: monocyte chemoattractant protein 1; MIP-1α: macrophage inflammatory protein-1 alfa; MIG: monokyne induced by interferon-gamma; MMP-9: matrix metalloproteinase-9; SDF-1: stromal derived factor-1. AT: adipose tissue; PBMC: peripheral blood mononuclear cells; CD: cluster of differentiation; IL: interleukin; TNF-α: tumor necrosis factor-alfa; IFN-γ: interferon gamma; MLR: mixed lymphocyte reaction; PGE2: prostaglandin E2; BM: bone marrow; UC: umbilical cord blood; UCT: umbilical cord tissue; NR: not reported. Abouelkheir, M, Eltantawy, DA, Saad, M.-A, Abdelrahman, KM, Sobh, M.-A, Lotfy, A, and Sobh, MA (2016). Mesenchymal stem cells versus their conditioned medium in the treatment of cisplatin-induced acute kidney injury: evaluation of efficacy and cellular side effects. Int. J. Clin. Exp. Med. 9, 23222-23234. Alcayaga-Miranda, F, Cuenca, J, Luz-Crawford, P, Aguila-Diaz, C, Fernandez, A, Figueroa, FE, and Khoury, M (2015). Characterization of menstrual stem cells: angiogenic effect, migration and hematopoietic stem cell support in comparison with bone marrow mesenchymal stem cells. Stem Cell Res. Ther. 6, 32. Arutyunyan, I, Elchaninov, A, Makarov, A, and Fatkhudinov, T (2016). Umbilical Cord as Prospective Source for Mesenchymal Stem Cell-Based Therapy. Stem Cells Int. 2016, 6901286. Bahamondes, F, Flores, E, Cattaneo, G, Bruna, F, and Conget, P (2017). Omental adipose tissue is a more suitable source of canine Mesenchymal stem cells. BMC Vet. Res. 13, 166. Bai, C, Gao, Y, Li, Q, Feng, Y, Yu, Y, Meng, G, Zhang, M, and Guan, W (2015). Differentiation of chicken umbilical cord mesenchymal stem cells into beta-like pancreatic islet cells. Artif. Cells Nanomed. Biotechnol. 43, 106-111. Bartholomew, A, Sturgeon, C, Siatskas, M, Ferrer, K, McIntosh, K, Patil, S, Hardy, W, Devine, S, Ucker, D, Deans, R, Moseley, A, and Hoffman, R (2002). Mesenchymal stem cells suppress lymphocyte proliferation in vitro and prolong skin graft survival in vivo. Exp. Hematol. 30, 42-48. Bonab, MM, Alimoghaddam, K, Talebian, F, Ghaffari, SH, Ghavamzadeh, A, and Nikbin, B (2006). Aging of mesenchymal stem cell in vitro. BMC Cell Biol. 7, 14. Boomsma, RA, and Geenen, DL (2012). Mesenchymal stem cells secrete multiple cytokines that promote angiogenesis and have contrasting effects on chemotaxis and apoptosis. PLoS ONE. 7, e35685. Brown, SG, Harman, RJ, and Black, LL (2012). Adipose-derived stem cell therapy for severe muscle tears in working German shepherds: two case reports. Stem Cell Discovery. 2, 41-44. Burr, SP, Dazzi, F, and Garden, OA (2013). Mesenchymal stromal cells and regulatory T cells: the Yin and Yang of peripheral tolerance?. Immunol. Cell Biol. 91, 12-18. Byeon, JS, Lee, J, Kim, DH, Lee, G.-B, Kim, H.-R, Gu, N.-Y, Cho, I.-S, and Cha, S.-H (2016). Canine mesenchymal stem cells immunomodulate atopic dermatitis through the induction of regulatory T cells in an ex vivo experimental study. J. Prev. Vet. Med. 40, 12-21. Caplan, AI (1991). Mesenchymal stem cells. J. Orthop. Res. 9, 641-650. Carrade Holt, DD, Wood, JA, Granick, JL, Walker, NJ, Clark, KC, and Borjesson, DL (2014). Equine mesenchymal stem cells inhibit T cell proliferation through different mechanisms depending on tissue source. Stem Cells Dev. 23, 1258-1265. Case, JB, Palmer, R, Valdes-Martinez, A, Egger, EL, and Haussler, KK (2013). Gastrocnemius tendon strain in a dog treated with autologous mesenchymal stem cells and a custom orthosis. Vet. Surg. 42, 355-360. Chen, LB, Jiang, XB, and Yang, L (2004). Differentiation of rat marrow mesenchymal stem cells into pancreatic islet beta-cells. World J. Gastroenterol. 10, 3016-3020. Cyranoski, D (2013). Stem cells boom in vet clinics. Nature. 496, 148-149.
de Mattos Carvalho, A, Alves, ALG, de Oliveira, PGG, Cisneros Álvarez, LE, Amorim, RL, Hussni, CA, and Deffune, E (2011). Use of adipose tissue-derived mesenchymal stem cells for experimental tendinitis therapy in equines. J. Equine Vet. Sci. 31, 26-34. Domergue, S, Bony, C, Maumus, M, Toupet, K, Frouin, E, Rigau, V, Vozenin, MC, Magalon, G, Jorgensen, C, and Noel, D (2016). Comparison between stromal vascular fraction and adipose mesenchymal stem cells in remodeling hypertrophic scars. PLoS ONE. 11, e0156161. Dominici, M, Le Blanc, K, Mueller, I, Slaper-Cortenbach, I, Marini, F, Krause, D, Deans, R, Keating, A, Prockop, D, and Horwitz, E (2006). Minimal criteria for defining multipotent mesenchymal stromal cells. The International Society for Cellular Therapy position statement. Cytotherapy. 8, 315-317. Engela, AU, Baan, CC, Dor, FJ, Weimar, W, and Hoogduijn, MJ (2012). On the interactions between mesenchymal stem cells and regulatory T cells for immunomodulation in transplantation. Front. Immunol. 3, 126. Engela, AU, Baan, CC, Peeters, AM, Weimar, W, and Hoogduijn, MJ (2013). Interaction between adipose tissue-derived mesenchymal stem cells and regulatory T-cells. Cell Transplant. 22, 41-54. English, K, and Mahon, BP (2011). Allogeneic mesenchymal stem cells: agents of immune modulation. J. Cell. Biochem. 112, 1963-1968. Fallarino, F, Grohmann, U, Vacca, C, Bianchi, R, Orabona, C, Spreca, A, Fioretti, MC, and Puccetti, P (2002). T cell apoptosis by tryptophan catabolism. Cell Death Differ. 9, 1069-1077. Fei, X, Jiang, S, Zhang, S, Li, Y, Ge, J, He, B, Goldstein, S, and Ruiz, G (2013). Isolation, culture, and identification of amniotic fluid-derived mesenchymal stem cells. Cell Biochem. Biophys. 67, 689-694. Friedenstein, AJ, Chailakhjan, RK, and Lalykina, KS (1970). The development of fibroblast colonies in monolayer cultures of guinea-pig bone marrow and spleen cells. Cell Tissue Kinet. 3, 393-403. Gaafar, T, Attia, W, Mahmoud, S, Sabry, D, Aziz, OA, Rasheed, D, and Hamza, H (2017). Cardioprotective effects of wharton jelly derived mesenchymal stem cell transplantation in a rodent model of myocardial injury. Int. J. Stem Cells. 10, 48-59. Ganguly, P, El-Jawhari, JJ, Giannoudis, PV, Burska, AN, Ponchel, F, and Jones, EA (2017). Age-related changes in bone marrow mesenchymal stromal cells: a potential impact on osteoporosis and osteoarthritis development. Cell Transplant. 26, 1520-1529. Gibson, M, Brown, SG, and Brown, NO (2017). Semitendinosus myopathy and treatment with adipose-derived stem cells in working German shepherd police dogs. Can. Vet. J. 58, 241-246. Glennie, S, Soeiro, I, Dyson, PJ, Lam, EW, and Dazzi, F (2005). Bone marrow mesenchymal stem cells induce division arrest anergy of activated T cells. Blood. 105, 2821-2827. Guercio, A, Di Marco, P, Casella, S, Cannella, V, Russotto, L, Purpari, G, Di Bella, S, and Piccione, G (2012). Production of canine mesenchymal stem cells from adipose tissue and their application in dogs with chronic osteoarthritis of the humeroradial joints. Cell Biol. Int. 36, 189-194. Hakki, SS, Turac, G, Bozkurt, SB, Kayis, SA, Hakki, EE, Sahin, E, Subasi, C, and Karaoz, E (2017). Comparison of different sources of mesenchymal stem cells: palatal versus lipoaspirated adipose tissue. Cells Tissues Organs. 204, 228-240. Han, SM, Kim, HT, Kim, KW, Jeon, KO, Seo, KW, Choi, EW, and Youn, HY (2015). CTLA4 overexpressing adipose tissue-derived mesenchymal stem cell therapy in a dog with steroid-refractory pemphigus foliaceus. BMC Vet. Res. 11, 49. Jacobs, SA, Roobrouck, VD, Verfaillie, CM, and Van Gool, SW (2013). Immunological characteristics of human mesenchymal stem cells and multipotent adult progenitor cells. Immunol. Cell Biol. 91, 32-39. Kaewsuwan, S, Song, SY, Kim, JH, and Sung, JH (2012). Mimicking the functional niche of adipose-derived stem cells for regenerative medicine. Expert Opin. Biol. Ther. 12, 1575-1588. Kalinski, P (2012). Regulation of immune responses by prostaglandin E2. J. Immunol. 188, 21-28. Kang, JW, Kang, KS, Koo, HC, Park, JR, Choi, EW, and Park, YH (2008). Soluble factors-mediated immunomodulatory effects of canine adipose tissue-derived mesenchymal stem cells. Stem Cells Dev. 17, 681-693. Kim, CH, Lee, JH, Won, JH, and Cho, MK (2011). Mesenchymal stem cells improve wound healing in vivo via early activation of matrix metalloproteinase-9 and vascular endothelial growth factor. J. Korean Med. Sci. 26, 726-733. Kim, HS, Kim, KH, Kim, SH, Kim, YS, Koo, KT, Kim, TI, Seol, YJ, Ku, Y, Rhyu, IC, Chung, CP, and Lee, YM (2010). Immunomodulatory effect of canine periodontal ligament stem cells on allogenic and xenogenic peripheral blood mononuclear cells. J. Periodontal. Implant. Sci. 40, 265-270. Kim, HW, Song, WJ, Li, Q, Han, SM, Jeon, KO, Park, SC, Ryu, MO, Chae, HK, Kyeong, K, and Youn, HY (2016). Canine adipose tissue-derived mesenchymal stem cells ameliorate severe acute pancreatitis by regulating T cells in rats. J. Vet. Sci. 17, 539-548. Kisiel, AH, McDuffee, LA, Masaoud, E, Bailey, TR, Esparza Gonzalez, BP, and Nino-Fong, R (2012). Isolation, characterization, and in vitro proliferation of canine mesenchymal stem cells derived from bone marrow, adipose tissue, muscle, and periosteum. Am. J. Vet. Res. 73, 1305-1317. Kondo, M, Yamaoka, K, Sakata, K, Sonomoto, K, Lin, L, Nakano, K, and Tanaka, Y (2015). Contribution of the Interleukin-6/STAT-3 signaling pathway to chondrogenic differentiation of human mesenchymal stem cells. Arthritis Rheumatol. 67, 1250-1260. Kopen, GC, Prockop, DJ, and Phinney, DG (1999). Marrow stromal cells migrate throughout forebrain and cerebellum, and they differentiate into astrocytes after injection into neonatal mouse brains. Proc. Natl. Acad. Sci. U.S.A. 96, 10711-10716. Krampera, M, Galipeau, J, Shi, Y, Tarte, K, and Sensebe, L (2013). Immunological characterization of multipotent mesenchymal stromal cells--The International Society for Cellular Therapy (ISCT) working proposal. Cytotherapy. 15, 1054-1061. Lawson, J, Elliott, J, Wheeler-Jones, C, Syme, H, and Jepson, R (2015). Renal fibrosis in feline chronic kidney disease: known mediators and mechanisms of injury. Vet. J. 203, 18-26. Le Blanc, K, Tammik, L, Sundberg, B, Haynesworth, SE, and Ringden, O (2003). Mesenchymal stem cells inhibit and stimulate mixed lymphocyte cultures and mitogenic responses independently of the major histocompatibility complex. Scand. J. Immunol. 57, 11-20. Lee, JY, Uzuka, Y, Tanabe, S, and Sarashina, T (2004). Prevalence of thyroglobulin autoantibodies detected by enzyme-linked immunosorbent assay of canine serum in hypothyroid, obese and healthy dogs in Japan. Res. Vet. Sci. 76, 129-132. Lee, WS, Suzuki, Y, Graves, SS, Iwata, M, Venkataraman, GM, Mielcarek, M, Peterson, LJ, Ikehara, S, Torok-Storb, B, and Storb, R (2011). Canine bone marrow-derived mesenchymal stromal cells suppress alloreactive lymphocyte proliferation in vitro but fail to enhance engraftment in canine bone marrow transplantation. Biol. Blood Marrow Transplant. 17, 465-475. Lei, J, Wang, Z, Hui, D, Yu, W, Zhou, D, Xia, W, Chen, C, Zhang, Q, Wang, Z, Zhang, Q, and Xiang, AP (2011). Ligation of TLR2 and TLR4 on murine bone marrow-derived mesenchymal stem cells triggers differential effects on their immunosuppressive activity. Cell. Immunol. 271, 147-156. Lim, JY, Im, KI, Lee, ES, Kim, N, Nam, YS, Jeon, YW, and Cho, SG (2016). Enhanced immunoregulation of mesenchymal stem cells by IL-10-producing type 1 regulatory T cells in collagen-induced arthritis. Sci. Rep. 6, 26851. Liu, YL, Liu, WH, Sun, J, Hou, TJ, Liu, YM, Liu, HR, Luo, YH, Zhao, NN, Tang, Y, and Deng, FM (2014). Mesenchymal stem cell-mediated suppression of hypertrophic scarring is p53 dependent in a rabbit ear model. Stem Cell Res. Ther. 5, 136. Lo, B, and Parham, L (2009). Ethical issues in stem cell research. Endocr. Rev. 30, 204-213. Ma, S, Chen, X, Wang, L, Wei, Y, Ni, Y, Chu, Y, Liu, Y, Zhu, H, Zheng, R, and Zhang, Y (2017). Repairing effects of ICAM-1-expressing mesenchymal stem cells in mice with autoimmune thyroiditis. Exp. Ther. Med. 13, 1295-1302. Mahla, RS (2016). Stem cells applications in regenerative medicine and disease therapeutics. Int. J. Cell Biol. 2016, 6940283. Matsui, F, Babitz, SA, Rhee, A, Hile, KL, Zhang, H, and Meldrum, KK (2017). Mesenchymal stem cells protect against obstruction-induced renal fibrosis by decreasing STAT3 activation and STAT3-dependent MMP-9 production. Am. J. Physiol. Renal Physiol. 312, F25-F32. Matsui, F, and Meldrum, KK (2012). The role of the Janus kinase family/signal transducer and activator of transcription signaling pathway in fibrotic renal disease. J. Surg. Res. 178, 339-345. Mrozik, KM, Zilm, PS, Bagley, CJ, Hack, S, Hoffmann, P, Gronthos, S, and Bartold, PM (2010). Proteomic characterization of mesenchymal stem cell-like populations derived from ovine periodontal ligament, dental pulp, and bone marrow: analysis of differentially expressed proteins. Stem Cells De. 19, 1485-1499. Najimi, M, Berardis, S, El-Kehdy, H, Rosseels, V, Evraerts, J, Lombard, C, El Taghdouini, A, Henriet, P, van Grunsven, L, and Sokal, EM (2017). Human liver mesenchymal stem/progenitor cells inhibit hepatic stellate cell activation: in vitro and in vivo evaluation. Stem Cell Res. Ther. 8, 131. Nordgren, TM, Bailey, KL, Heires, AJ, Katafiasz, D, and Romberger, DJ (2018). Effects of agricultural organic dusts on human lung-resident mesenchymal stem (stromal) cell function. Toxicol. Sci. 162, 635-644. Otabe, K, Muneta, T, Kawashima, N, Suda, H, Tsuji, K, and Sekiya, I (2012). Comparison of gingiva, dental pulp, and periodontal ligament cells from the standpoint of mesenchymal stem cell properties. Cell Med. 4, 13-21. Plumas, J, Chaperot, L, Richard, MJ, Molens, JP, Bensa, JC, and Favrot, MC (2005). Mesenchymal stem cells induce apoptosis of activated T cells. Leukemia. 19, 1597-1604. Raabe, O, Shell, K, Goessl, A, Crispens, C, Delhasse, Y, Eva, A, Scheiner-Bobis, G, Wenisch, S, and Arnhold, S (2013). Effect of extracorporeal shock wave on proliferation and differentiation of equine adipose tissue-derived mesenchymal stem cells in vitro. Am. J. Stem Cells. 8, 62-73. Rawlings, JS, Rosler, KM, and Harrison, DA (2004). The JAK/STAT signaling pathway. J Cell Sci. 117, 1281-1283. Reiter, J, Drummond, S, Sammour, I, Huang, J, Florea, V, Dornas, P, Hare, JM, Rodrigues, CO, and Young, KC (2017). Stromal derived factor-1 mediates the lung regenerative effects of mesenchymal stem cells in a rodent model of bronchopulmonary dysplasia. Respir. Res. 18, 137. Ren, H, Sang, Y, Zhang, F, Liu, Z, Qi, N, and Chen, Y (2016). Comparative analysis of human mesenchymal stem cells from umbilical cord, dental pulp, and menstrual blood as sources for cell therapy. Stem Cells Int. 2016, 3516574. Rhee, KJ, Lee, JI, and Eom, YW (2015). Mesenchymal Stem CellMediated Effects of Tumor Support or Suppression. Int. J. Mol. Sci. 16, 30015-30033. Ryan, JM, Barry, F, Murphy, JM, and Mahon, BP (2007). Interferon-gamma does not break, but promotes the immunosuppressive capacity of adult human mesenchymal stem cells. Clin. Exp. Immunol. 149, 353-363. Sato, K, Ozaki, K, Oh, I, Meguro, A, Hatanaka, K, Nagai, T, Muroi, K, and Ozawa, K (2007). Nitric oxide plays a critical role in suppression of T-cell proliferation by mesenchymal stem cells. Blood. 109, 228-234. Schlosser, S, Dennler, C, Schweizer, R, Eberli, D, Stein, JV, Enzmann, V, Giovanoli, P, Erni, D, and Plock, JA (2012). Paracrine effects of mesenchymal stem cells enhance vascular regeneration in ischemic murine skin. Microvasc. Res. 83, 267-275. Schuh, EM, Friedman, MS, Carrade, DD, Li, J, Heeke, D, Oyserman, SM, Galuppo, LD, Lara, DJ, Walker, NJ, Ferraro, GL, Owens, SD, and Borjesson, DL (2009). Identification of variables that optimize isolation and culture of multipotent mesenchymal stem cells from equine umbilical-cord blood. Am. J. Vet. Res. 70, 1526-1535. Shabbir, A, Zisa, D, Lin, H, Mastri, M, Roloff, G, Suzuki, G, and Lee, T (2010). Activation of host tissue trophic factors through JAK-STAT3 signaling: a mechanism of mesenchymal stem cell-mediated cardiac repair. Am. J. Physiol. Heart Circ. Physiol. 299, H1428-H1438. Sharma, RR, Pollock, K, Hubel, A, and McKenna, D (2014). Mesenchymal stem or stromal cells: a review of clinical applications and manufacturing practices. Transfusion. 54, 1418-1437. Singer, NG, and Caplan, AI (2011). Mesenchymal stem cells: mechanisms of inflammation. Annu. Rev. Pathol. 6, 457-478. Sousa, MG, Paulino-Junior, D, Pascon, JP, Pereira-Neto, GB, Carareto, R, Champion, T, and Camacho, AA (2011). Cardiac function in dogs with chronic Chagas cardiomyopathy undergoing autologous stem cell transplantation into the coronary arteries. Can. Vet. J. 52, 869-874. Squillaro, T, Peluso, G, and Galderisi, U (2016). Clinical trials with mesenchymal stem cells: an update. Cell Transplant. 25, 829-848. Strioga, M, Viswanathan, S, Darinskas, A, Slaby, O, and Michalek, J (2012). Same or not the same? Comparison of adipose tissue-derived versus bone marrow-derived mesenchymal stem and stromal cells. Stem Cells Dev. 21, 2724-2752. Teixeira, FG, Panchalingam, KM, Anjo, SI, Manadas, B, Pereira, R, Sousa, N, Salgado, AJ, and Behie, LA (2015). Do hypoxia/normoxia culturing conditions change the neuroregulatory profile of Wharton Jelly mesenchymal stem cell secretome?. Stem Cell Res. Ther. 6, 133. Tidd, N, Michelsen, J, Hilbert, B, and Quinn, JC (2017). Minicircle mediated gene delivery to canine and equine mesenchymal stem cells. Int. J. Mol. Sci. 18, E819. Ulrich, D, Muralitharan, R, and Gargett, CE (2013). Toward the use of endometrial and menstrual blood mesenchymal stem cells for cell-based therapies. Expert Opin. Biol. Ther. 13, 1387-1400. Ullah, I, Subbarao, RB, and Rho, GJ (2015). Human mesenchymal stem cells - current trends and future prospective. Biosci. Rep. 35, e00191. Vidal, MA, Robinson, SO, Lopez, MJ, Paulsen, DB, Borkhsenious, O, Johnson, JR, Moore, RM, and Gimble, JM (2008). Comparison of chondrogenic potential in equine mesenchymal stromal cells derived from adipose tissue and bone marrow. Vet. Surg. 37, 713-724. Volk, SW, and Theoret, C (2013). Translating stem cell therapies: the role of companion animals in regenerative medicine. Wound Repair Regen. 21, 382-394. Wipff, PJ, and Hinz, B (2008). Integrins and the activation of latent transforming growth factor beta1 - an intimate relationship. Eur. J. Cell Biol. 87, 601-615. Xiong, H, Bai, C, Wu, S, Gao, Y, Lu, T, Hu, Q, Guan, W, and Ma, Y (2014). Biological characterization of mesenchymal stem cells from bovine umbilical cord. Animal Cells and Systems. 18, 59-67. Zhu, W, and Liang, M (2015). Periodontal ligament stem cells: current status, concerns, and future prospects. Stem Cells Int. 2015, 972313.